It Matters! Are You Prepared? 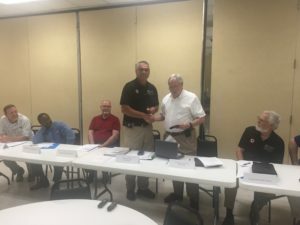 West Tennessee Seismic Safety Commission Meeting June 19th 2018 - It Matters! Are You Prepared? The West Tennessee Seismic Safety Commission met June 19th at Millington, Tennessee. During the meeting the commission decided on several action items relating to funding of several commission related projects. Also the commission noted the transition from one Chairman to his successor with the presentation of a ceremonial gavel to outgoing Chairman Gary Graves by incoming Chairman Mike Moore.